Tomacelli's Pizza & PastaWhere quality is right in the recipe! Try one of our many delicious pasta combinations! Welcome to the Tomacellis web page! 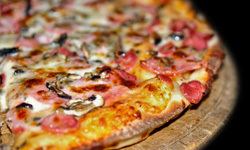 We make pizza and pasta so good you won't beleive your taste buds! Come in for dine in or pickup at one of our locations around Sioux Falls. Or just call in and have delicious pizza, pasta, or wings delivered directly to your house! Tomacellis has been making great food for the Sioux Falls area for many years. Our goal is to provide great tasting, high quality food at a reasonable price. Call in for carry-out or delivery today!